Salve guys! Welcome back to the states, hope you’re over jet lag by now ( I know when I studied abroad, it took me at least a day to recover). 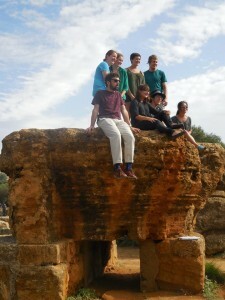 This picture is from the Temple of Juno at Agrigento, which I’m sure you guys visited. It was raining while I was there, as you can see from the rainjacket (#llbeans4life). Hopefully it didn’t rain for you guys? Anyways, back to academic things. Quick pop quiz: what kind of temple is this behind me? If you said Doric, you’re totally right! You can tell from the columns behind me, which are fluted, and the plain capitals, although it’s a tad hard to see in these columns. The Temple of Juno was built between 460-440 BC, and lies east of the Temple of Concord on a rise in Agrigento. It was built after the Battle of Himera by the Gelians who founded Akragas (Agrigento’s Greek colony name), and actually still has traces of the beating (well, perhaps more like burning) that it took from the Carthaginians in 406 BC. 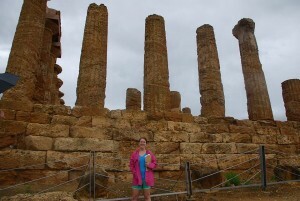 Also notable in the Agrigento archaeological park is the Temple of Zeus. This temple (see below for one of its capitals that we’re standing on) has the distinguished mark of having some of the largest Doric capitals in Sicily, although unfortunately most of the temple is not standing today. However, it was planned to be the main temple in Akragas and was situated by the city’s agora* for that reason. It was first started in the 580’s, but doesn’t appear to have been finished when the Carthaginians came to call, and post-Carthaginians in the early 400’s, it was allowed to fall into disrepair. The whole city never really fully recovered after the Carthaginians’ attack. The Romans soon came to claim Akragas for their own in 210 BC, and renamed it Agrigentum (a more Latin sounding name). From there, it clearly was only a letter change away from the Italian Agrigento town that many tourists flock to today. *For those of you Latin scholars such as myself, the agora was the civic and commercial hub of any Greek settlement. Centro Class Lecture Notes, Sicily Trip. Professor Fagan. October 2016. “Akragas (Site).” Perseus. Web. <http://www.perseus.tufts.edu/hopper/artifact?name=Akragas&object=site>.